Educational Technology For Teaching and Learning: SweetSearch: A New Alternative to Google. With several hundred million search queries each day, Google is the undisputed leader in search engines. There's a reason why "google" is widely used as a verb! But for many types of Internet searches, especially for students, Google is not always the best choice. I recommend several alternatives for students, including several which are actually customized google search engines designed for kids: www.askkids.com, www.kidrex.org, www.gogooligans.com, and www.kidsclick.org. Now there's another promising alternative to Google. 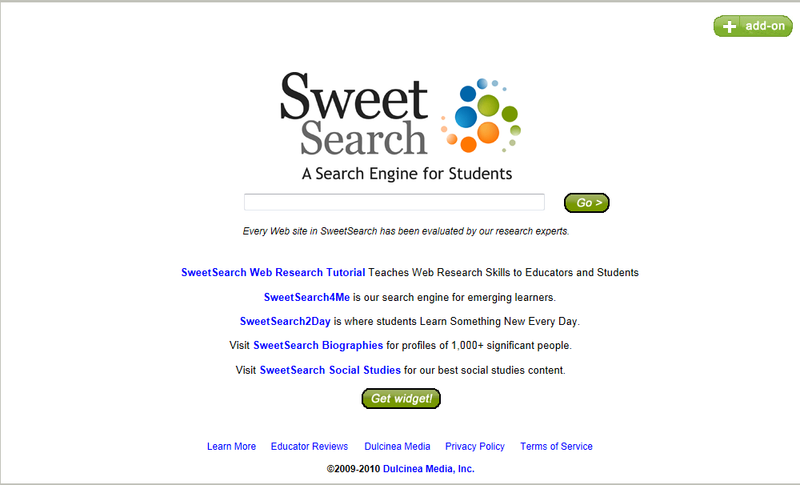 SweetSearch was created to address the reality that most students cannot effectively conduct online research. Results from a Google search are simply too overwheming, and often not educationally appropriate. SweetSearch (which is a customized version of Google) can help kids find better information more quickly, and will return only content that has been researched, evaluated, and approved by a team of researchers, teachers, and librarians. I tried searching a few topics and was impressed with the quality and organization of the results. There are several neat features, inlcuding SweetSearch Biographies, which includes profiles of over 1,000 famous people. A word of caution, however: before conducting a search lesson with young students, I strongly recommend testing the search results first. Even search engines designed for children can yield unexpected, and possibly undesirable, results!